This deep exfoliating and intensive moisturizing formula softens and hydrates dry, cracked, callused, and rough skin on the hands, feet, and all over the body. Helps to reduce cracks and calluses. Lifts away spots for a more even skin tone. 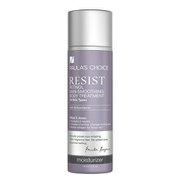 Penetrates deeply to restore skin. Helps to reduce Keratosis Pilaris. Use at night or as recommended. Smooth a very thin layer over the clean and dry skin of the treatment area. Do not apply to eyes or eye lids. Tingling is normal. Skin may appear rough and dry at first. Continued use will result in softer, smoother skin. Wash hands after application. My nail technician recommended this product to me because my heels get very dry and cracked all year long no matter how many times I moisturize them. Cracked heels are no fun....the skin can become broken and painful as the layers of dead skin cells build up. The Hand Foot Body Restoration cream exfoliates the dead skin bit by bit revealing smooth skin over time. I have used this product every night before bed for three years and I love the results. It's expensive, but it's worth it.